January, 2015 | H&R Group K.K. “You make your own luck in this world,” as the saying goes. Whoever coined the phrase could have been thinking of the Hadaka Matsuri in Konomiya, but making your luck here is no simple task. It takes strength, perseverance and a (perhaps sake induced) imperviousness to the cold. If you think you’re up to it, read on. Hadaka Matsuri, literally Naked Festival, is an annual event and has been held in Konomiya, just outside Nagoya, since 787AD following Emperor Shotoku’s request for invocations to dispel plagues from the nation. There are various origin stories for the festival, some of which are particularly gruesome involving human sacrifice, but today it continues as a way of ridding the town and its people from misfortune for the coming lunar year. It begins early in the afternoon of the 13th day of the lunar calendar (this year March 3, 2015) as troupes of men wander the streets carrying poles of bamboo to deposit in Owariōkunitama Shrine (locally known as Konomiya shrine). Doesn’t sound so interesting? Did I forget to mention they are near naked? Well, they are. Wrapped in only a fundoshi loincloth, they carry their bamboo naoizasa – wrapped in the prayers, names and birthdays of the of their village’s women, children and sick men unable to take part – through the icy winter streets. As they parade they perform daredevil stunts, swinging their gargantuan poles and climbing to their tops, all for the amusement of the on-looking crowds. Eventually they arrive at the shrine and run hell-for-leather inside, hurling in their naoizasa. Once this opening ritual has been performed they are free to congregate for food, rest, and to top up their sake levels (the best way they have for fighting off the biting cold). Once all 9,000–10,000 participants have passed through the shrine, the main event can take place. Everyone gathers inside the shrine’s grounds and awaits the appearance of the Shin Otoko, the ‘God man’. This local man has been selected from many hopefuls and been given the dubious honor of becoming a semi-deity. He will have spent the previous three days in prayer, locked in solitary confinement and fed on nothing but a thin rice gruel. Finally he is completely shaved, stripped totally naked, and sent out into the thronging mob, who proceed to crush towards him with the aim of touching, hitting and slapping him. Though this sounds somewhat harsh, it is believed that through physical contact participants can pass on their household’s bad luck for the year to this God man. Of course when nearly 10,000 men are trying to touch a solitary naked wretch things can get a little bit dangerous, so he has bodyguards to watch over him cannoning buckets of ice cold water on everyone to cool any growing violence. Eventually the masses drive the shin otoko into the temple (representing the struggle of the early shin-otokos who were chosen against their will and dragged to the shrine and perhaps their death) where he is rescued, and taken inside to nurse his multitude of wounds for a few hours. Later he will sneak out in the late night darkness with an ash-covered mochi rice cake called tsuchi-mochi, signifying the misfortune his beating accumulated. He will then bury it and the town’s bad luck will go with it into the ground. With the shin otoko safely dispatched, the rest of the parade can head off to nurse their own wounds, clutching their freezing wet fundoshi, in search of warmth, safe in the knowledge that their year’s luck is assured. For those who want to witness one of the oldest naked festivals in Japan, it can all be watched from the relative safety of the sidelines, eating and drinking from the festival food stalls, or even on local television. However, for the more hardy souls amongst you, you can take part with assistance from the ever excellent kikuko-nagoya. They will help you join part of a team, and even supply you (at a cost) with the fundoshi and tabi shoes required to take part. It may seem like a crazy idea, but take it from someone who will be taking part for the third consecutive year, it is one of the most exhilarating things you will do in Japan, and it is certainly a great story to tell folks back home. Tokyo is Mecca to anime and manga fans, and lovers of technology can find anything they seek, somewhere in the metropolis. If you are seeking nightlife, you won’t find many places in the world better, from food to music, from excitement to beauty, Tokyo has it all. But alongside Tokyo’s glitter and frenetic pace you will find children and parents, and a wide variety of activities for the family. Tokyo is not just a metropolis, it is home for many. If you are looking for a child friendly activity or two, we can’t come close to telling everything that is available to you and your children here, but we can give you some samples. Sanrio Puroland is a theme park run by the Sanrio company, creators of the global phenomenon that is Hello Kitty as well as Cinnamorroll, My Melody, Jewelpet and others. Unlike Japan’s other character based fun parks such as Disneyland, Sanrio Puroland focuses less on rides and roller coasters and more on interactive events such as musicals and audience participation shows. It is an all-weather park, meaning that in the chilly winter or stifling summer, families with young children can comfortably enjoy the uber-cuteness of the Sanrio world, including a near full-scale creation of Kitty chan’s home. Children whose birthday falls in the month of their visit are given a birthday card to be worn so they can be given special treatment from the Sanrio characters they meet, and take part in birthday party celebrations. Of course there are extensive shopping opportunities, with all manner of products and souvenirs bearing the various characters’ likenesses, as well as a family restaurant complete with branded cutlery and condiments. Opening times vary. See schedule for details. The Ghibli Museum is an animation and art museum created for lovers of the world-renowned Studio Ghibli, the imaginative geniuses who brought us such animated classics as Spirited Away, Princess Mononoke and My Neighbor Totoro. The museum itself was designed by the studio’s most famous director, Hayao Miyazaki, and upon entering, as you are greeted by Totoro himself, you will feel like you have been whisked away into one of his worlds. There are all kinds of Ghibli excitements on show in this museum dedicated to the history and science of animation, such as permanent exhibitions like the 3-D zoetrope of ‘Bouncing Totoro’ designed to explain the principals of animation and historical devices. There is also a Rooftop Garden featuring a life-size version of the robot from Castle in the Sky, and a Catbus playroom for the under 12s to play in. There are also seasonal exhibitions, but perhaps the most exciting aspect for fans of Ghibli is the showing of an animated short, exclusive to the museum. For those wanting to bring some of the magic home with them, the gift shop sells original animation cells. 100 JPY young children (4-6), 400 JPY children (7-12), 700 JPY teens (13-18) 1,000 JPY adults (19+); Tickets can only be purchased at Lawson convenience stores. For instructions, see here. 10:00-18:00; Closed Tuesday and year end holidays. The Tokyo Toy Museum in Shinjuku is three stories of toys. Toys to be touched and played with, toys to be created from recycled materials, toys to be enjoyed by you and your family. On top of three stories, you will find a playground outside with… more toys. You can also go for more formalized fun, in the form of classes and workshops ranging from building your own toys, to origami, and a lot of different kinds of events in between. I could write on about this location, but if you are interested in learning more please follow this link to www.tokyocheapo.com, where they have a very excellent article on the museum. “Kingdom Quest,” an interactive LEGO laser ride, looks like it may be the coolest thing ever. Tokyo and its surrounding areas have more aquariums than you might expect! There are at least 7 in Tokyo itself, and a few more in the surrounding areas. At the Shinagawa Aquarium you can experience a real “walk under water” while sea bream, stingrays, and turtles swim overhead and around in their famous “sea tunnel!” Or visit the “Shark Hall” where sand tiger sharks, grey reef sharks, and other sharks from all over the world are displayed in an oval tank which puts you in the middle of a three-dimensional school of sharks! If sharks are a bit too much for you, how about the Dolphin and Sealion Show, which includes all that has come to be expected from such shows, jumping, “humorous gestures,” etc.? JNTO – Aquariums in Tokyo & Vicinity The official Japan Tourism page has directions and contact details, and I believe offers the most complete listing of aquariums in Tokyo. Although Japan adopted the Gregorian calendar in 1873, a celebration of the Chinese year is still an important cultural event. 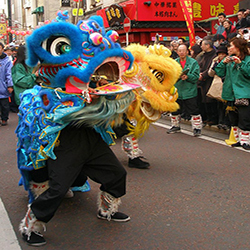 This year (2015) the Chinese New Year falls on the 19th of February, and it will be celebrated with particular fervor in Yokohama’s famous Chinatown. Yokohama Chūkagai has a 150-year history, stretching back to the Meiji era opening of Yokohama’s seaport, when many Chinese immigrants arrived in Japan. Today it is the largest Chinatown in Asia, one of the biggest in the world, with around 250 Chinese owned or themed shops and restaurants. As such the celebration of New Year is understandably large and this year’s event will be no different. 2015, the year of the ram, will be the 29th annual Spring Festival. Like other celebrations around the world it will take place from Chinese New Year’s Eve to the 15th day of the first lunar calendar month. The celebrations will kick off on the evening of February 18 when people will flock to Chinatown’s two major temples, Kwan Tai Temple and Mazu Miao temple, to light incense and offer prayers for ancestors. There will be a midnight countdown as revelers usher in the New Year, after which they will cause as great a noise as possible in order to chase off evil spirits. On New Year’s Day the celebrations begin in earnest. The whole area, adorned in red and gold banners sporting popular themes of happiness, wealth, good fortune or longevity, will be alive with people. The sounds and smoke of firecrackers popping will fill the air along with the hammering of traditional drums and cymbals. Between 15:30 and 20:00 you can see the parade of Chinese lions. Here each lion costume, manipulated by two dancers, more brightly colored than the last, will dance and perform acrobatics, parading through the streets. They will bring good luck to the shops and restaurants they enter, chasing away bad spirits, collecting red cash-filled envelopes as their reward. As well as the usual shops and restaurants there will be various forms of entertainment throughout the New Year festive period. On February 21, 22, 28 and March 1 there will be displays of Chinese performing arts including traditional dances and breathtaking acrobatics. You can also see harp performances and dragon dances. Hour long exhibitions will be held in Yamashita-cho park at 14:30, 16:00 and 17:30 on each of these days. Also through the entire New Year period, from February 19 to March 5 you can see the impressive artwork of the children of Yokohama Yamate Chinese school at Chinatown 80. Perhaps the highlight of the festival is the Celebration Parade. Many people will be dressed in traditional ethnic clothing, some in the costume of bygone emperors. They will gather to enjoy the gamboling and artistry of the famous Chinese dragons. These puppets, several meters long, supported by a team of dancers are perhaps the most well known aspect of Chinese New Year, and are not to be missed. The two-hour parade begins at 18:00 and takes place all over Chinatown. To mark the closing of The New Year festivities is the solemn, but visually stunning lantern festival. Set against the backdrop of Ma Zhu Miao shrine, between 17:30 and 19:00 lanterns are lit to guide home wayward spirits. These lanterns will bear wishes and dreams for the coming year, as well as messages to ancestors, sending those epistles floating to the heavens. Fireworks – Bamboo stems with gunpowder were used in ancient China to scare away evil spirits. These have become the firecrackers we know today. Many cities across the world have controlled or banned the use of fireworks at Chinese New Year due to the fire risk they pose, though Yokohama is not one of them. Red Envelopes – It was once believed that red would frighten evil spirits, and so it is into red envelopes that married or elderly people place money to give to unmarried juniors as a way of gaining good luck for the coming year. The envelopes will contain an odd numbered currency (even numbered currency is given at funerals) and will be placed under the pillow unopened and slept upon for 7 days. Clothing – New clothes will be worn, from top to toe, to symbolize a new beginning for a new year. These clothes will commonly be red or brightly colored to frighten evil spirits. Song – A popular song sung at this time of year is Xīn Nián Hǎo Ya; literally: “New Year’s Good”. Interestingly it has a melody not dissimilar to Oh My Darling, Clementine. Greetings – Want to wish someone ‘happy new year?’ Well, it’s ‘Xin Nian Kuai Le’, pronounced ‘sheen nian kwai luh’ in Mandarin or ‘San Nin Fai Lok’, pronounced ‘san knee fy lock’ in Cantonese. For a more traditional greeting try ‘wishing you great happiness and prosperity’ which is ‘Gong Xi Fa Cai’, pronounced ‘gong zee fah chai’ in Mandarin or in Cantonese ‘Gong Hey Fat Choy’, pronounced ‘gung hey fah choy’. Hiorshige Kato is a fourteenth generation pottery master – his family were one of only four families to be protected by the Shogunate from the warring state in order to make tea ceremony goods for Nagoya Castle. Over the years Studio Kasen has gone through several transformations and in its heyday was the heart of the Akazu pottery area in Seto. Now the little gallery and studio sit atop a little hill in Seto, and Kato-Sensei offers classes in pottery, both making it and glazing it. The class costs 2500 per adult and only 500 yen for him to glaze and fire whatever you want to keep, so it’s a great way to stock up on home-made souvenirs from the heart of Japan which will really remind you of your time here every time you use it. Children are also welcome, and Kato-Sensei gives all the extra help needed for pottery to look professional, first time.